Another late report for me. I'm still having trouble with my energy reserves - everything seems like a monumental effort. I'm waiting on some blood work to come back to see if perhaps I'm still anemic. If so, it means I'll have to start going in for B-12 shots. A pretty boring report for this week. Nothing in and not much out. 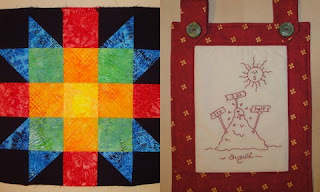 I had 2 finishes this week - 12 Sister's Choice blocks and the August Camelot Snowman hanging. The Sister's Choice blocks used 3.25 yards of fabric and the snowman wall hanging added another quarter yard. That's a total of 3.5 yards. (Please ignore the dirty clothes.) And then he kept trying to climb inside the fridge. I don't know what that was all about? "Give and it will be given unto you. And the measure you use to give out will be the measure which God uses to give back to you."